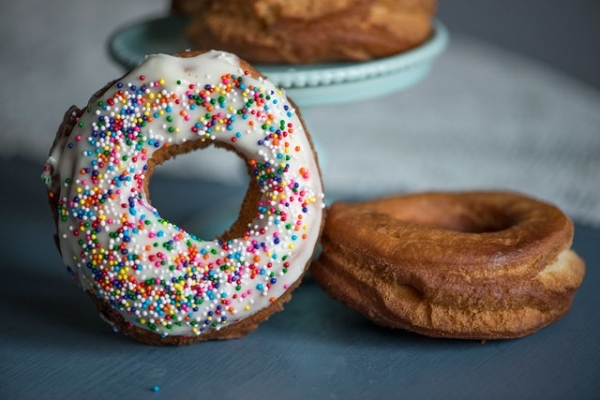 How to make old school cake donuts at home YUMM! In a large bowl, whisk together the sugar, baking powder, and salt. Add eggs, milk, and melted butter. Beat until smooth. Add flour and stir with a large wooden spoon. The dough should be soft and sticky but firm enough to handle. If necessary, add an additional 1/2 cup flour). Cover bowl with plastic wrap and allow to chill for 30-60 minutes. Remove dough from refrigerator and begin to heat about 1 inch of oil to 360 degrees Fahrenheit in a large metal skillet. You can tell oil is hot enough if a small piece of bread fries to a golden brown within ten seconds. Working with half the dough at a time, roll it out on a floured surface to 1/2 inch thickness. Cut out circles using a doughnut cutter or one large and one small biscuit cutter. Gently drop the doughnuts into the hot oil (I fried about three at a time). Flip them over as they puff and turn them a few times as they continue to fry. They should reach a deep golden brown within 2-3 minutes. Remove doughnuts with a slotted spoon and allow them to drip on a wire cookie rack (with paper towels beneath). If desired, you can douse them with cinnamon-sugar or a simple frosting (1 cup powdered sugar with 1-2 TBSP cream). Best enjoyed fresh.